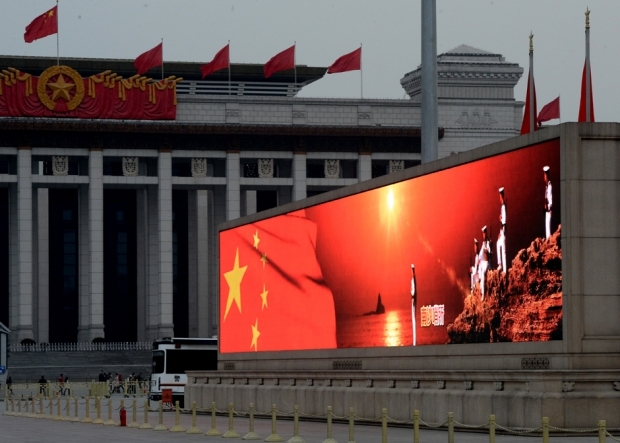 An image of the Chinese flag and sailors standing on the disputed Spratly Islands in the South China sea is displayed on a big screen in Tiananmen Square, March 2, 2013. It’s Pilates diplomacy—work on your core. China’s diplomats keep talking about China’s core interests and it’s a growing list. In 2011, China included its political system and social stability as core interests. This year, it has added a vast chunk of the South China Sea to its core. China’s certainly appearing more assertive in defining and defending that growing core. Has it achieved its goals? From what I’ve seen, the answer is an emphatic “no.” A decade of cultivating the image a of a friendly neighbor intent on a peaceful rise appears to have been squandered. Vietnam, the Philippines, Mongolia, India, Myanmar are have all had run-ins with China over territorial and business disputes. There’s a growing sense that China is starting to act like a bully and that’s given the U.S. an opening. So, instead of strengthening China’s role, China’s foreign policy has ended up creating a new opportunity for the U.S. in the region. Oops. The Japan dispute is more confusing to me. What’s at stake? A handful of rocky islands where there might be some natural gas and oil underneath. Estimates vary from more than the Gulf of Mexico to more than any country expect Venezuela and Saudi Arabia. That’s a lot, but the estimates are far from certain because with the dispute going on, no one has been able to really go and look. Second, it’s one thing to have a hydrocarbon underground, it’s another to see if it’s economically viable to get it out. The shale gas revolution in the U.S. has depressed global gas prices. Couldn’t Japan and China work out developing the reserves together? Plenty of oil fields are split between different companies as a way to spread the big risks and huge costs of developing complex projects. So why the chest beating? Is it playing to a domestic audience? Maybe. And Japan-bashing certainly has widespread appeal (just take a look at the anti-Japan riots last year). But there is a difference between taking to the street and going to war. Would the typical Chinese mother really want to send her son to die for the sovereignty of a rock? In China, foreign affairs are portrayed as very personal. A set phrase for diplomats is that something “hurt the feelings of the Chinese people.” To an outsider, that rings odd. One can't imagine Secretary Clinton angrily telling Putin “You've hurt the feelings of the American people.” Talk about “feelings” seems better suited for couples counseling than global politics. One Chinese scholar analyzed the use of the phrase and suggests it shows improved ties to the world -- after all you, only a friend can really hurt your feelings. The flip side, though, is if you're feelings are you hurt you may act irrationally. Could it be that the personal approach is more than just sloganeering? Could it be that when Chinese officials look at the world, it’s not about realpolitik, but about feelings? With the rhetoric of “core interests” Beijing seeks to articulate a reasonable basis on which it can expect the U.S. to accommodate China in Asia. The logic goes that if we can figure out which interests are truly core to each side—in effect, which interests are “legitimate”—then we can agree to a new division of influence that serves both sides fairly and preserves the security of each. Chinese ask, for example, how can the Philippines constitute a core interest for the U.S., which is so far away? If only Washington would recognize this logic and yield its remote, peripheral, non-core interests in Asia in favor of China’s truly essential, “legitimate” interests, then the two sides can enjoy peace. This is a well-meaning logic, but it is founded on a misunderstanding. There’s no a priori logic that can tell us which interests are core and which aren’t. American interests in Asia are important not because of geographical propinquity but because of how historic U.S. commitments to regional stability, freedom of navigation, and the like underpin an American vision of world order and the American way of life. Perhaps from an abstract standpoint American interests are merely “vested interests” and not “core interests.” But they are none the less interests, and Washington will not abandon them. The global balance of power has never been settled by debating over whose interest in a particular spot on the map is more legimate than whose. These types of questions are settled through practice rather than theory. This means that the two sides are in for some years or decades of friction and testing to see to what extent Beijing can shake Washington loose from some of its commitments in the region or to what extent the U.S. can contain China’s attempts to exert more influence. If both sides are careful—and they have plenty of reasons to be—a new equilibrium can be established without war. And it may turn out in the long run that both sides can enjoy influence in Asia and benefit from regional stability, freedom of navigation, and economic prosperity. Strategic interests are not always zero-sum. The dangers of introducing the notion of “core interest” to any territorial dispute that is not absolutely critical to a nation's future is that it denies diplomats flexibility to work out resolution, or possibly even to delay joining the issue at a more propitious time. In other words, the notion of something being irretrievably of “core interest,” denies Beijing foreign officials necessary latitude in seeking a peaceful solution. My own view in this matter is that China’s claim to the Diaoyudao is not without historical basis, but that it would be foolish—even massively destructive—in terms of its larger immediate interests to do anything to provoke a conflict with Japan. Both sides are now ginned up on a surfeit of nationalist sentiment, and when such sentiment is connected to issues of sovereignty, especially Confucian cultures where questions of “face” often make it impossible to compromise, much less to back down, you have a very inflammable combination of forces at work. Last week the Chinese government and military officially declared that the Diaoyu/Senkaku Islands constitute a “core interest” of the country. The Chinese government used this loaded term to send a clear warning to Japan and to the United States that China’s claim to the islands is non-negotiable and that it is prepared to use military force to defend it. It’s a highly significant signal by China in its coercive diplomacy over its maritime territorial claims that certainly got the attention of Tokyo and Washington. The United States takes no position on the territorial dispute per se. But the U.S.-Japan Security Treaty commits it to help defend the areas Japan controls, which includes the islands. That’s why the Obama administration will want to urge the Japanese government to get back to the negotiating table with China as soon as it can. China’s other Asian neighbors are also concerned because in a larger sense, it reflects the change in Chinese foreign policy from reassurance to resolve After more than a decade of sophisticated diplomacy designed to reassure the United States and its Asian neighbors that it wasn’t a threat despite its growing economic and military power, China has become more willing to dig in its heels and confront other countries particularly over issues that arouse nationalist emotions inside China and therefore can bolster public and interest group support for the Communist Party. Since last September, when the Japanese government purchased several of the islands to keep them out of the hands of Shintaro Ishigawa, the ultra-nationalist Governor of Tokyo who had announced his intention to buy them, the Chinese government has been using civilian maritime agency ships and planes to challenge Japan’s administration of the islands. Upping the pressure, the P.L.A. navy patrolled the waters near the islands on the April anniversary of the 1895 treaty that ended the Sino-Japanese war that the Chinese lost. To make sure the message came through loud and clear, top military officials first informed General Martin Dempsey, the Chairman of the U.S. Joint Chiefs of Staff who was visiting China. On the next day, it was announced from the podium of the Ministry of Foreign Affairs. “The Diaoyu Islands are about sovereignty and territorial integrity. Of course, it’s China’s core interest,” said Hua Chunying, the ministry spokesperson. You can be sure that the decision to call the Diaoyu Islands a “core interest” was thoroughly vetted by the key civilian decision-makers—Xi Jinping, Li Keqiang, and the other five leaders in the CCP Politburo, as well as the People’s Liberation Army leaders. It’s a considered act by a highly insecure CCP leadership willing to engage in international brinksmanship to maintain domestic support. In the past, the notion of “core interests”—an interest so crucial that the nation would use military force to defend it—was carefully restricted to the island of Taiwan. Beijing used it to signal clearly that it would go to war to prevent the formal independence of Taiwan, a humiliation that could threaten the survival of CCP rule. The leaders extended the “core interest” category to include Tibet and Xinjiang in domestic self-defense five years ago. The Chinese public, outraged by the online videos and photographs of the beating of Han Chinese citizens during the violent protests that broke out in those regions in 2008 and 2009, lambasted the government for failing to protect its own people. The Chinese government started cancelling meetings with European and American senior officials over their meetings with the Dalai Lama. But because all these governments already recognize P.R.C. sovereignty over Tibet and Xinjiang, the “core interest” terminology didn’t risk any outright military confrontation with them. The Diaoyu/Senkaku situation is potentially more dangerous than the South China Sea one and not just because the area is crowded with the ships and planes from the two countries that could collide at any time. Relations with Japan have always been a focal point of popular nationalism, and top leader Xi Jinping reportedly chairs the small group that coordinates government and military efforts to challenge Japan’s effective control over the islands. The decision to use the term “core interests” was undoubtedly made at the highest level. It is a public threat from which China’s insecure leaders won’t feel they dare to back down without some visible satisfaction from Japan. China’s original objective was a limited one, i.e. to get Japan to acknowledge that sovereignty over the islands is in dispute. Only once the two sides sit down at the negotiating table will we learn whether China is prepared to craft a carefully worded statement about the sovereignty dispute, agree to a mutual withdrawal from the islands, and declare victory. As Susan Shirk points out in China’s use of the “core interest” concept over the Senkaku/Diaoyu dispute, it is intended to demonstrate steely resolve and a willingness to use military force if necessary, which is one reason why the Chinese signaled this intent to General Dempsey first, before it was put into the public sphere by the Chinese Foreign Ministry. When you link this with Xi Jinping’s call to the P.L.A. to step up its preparations for “military struggle,” which has been his standard line in addresses to the military rank and file since he became commander-in-chief last November, then you are getting a far more militarized approach in how China is thinking and preparing for dealing with regional territorial issues under the new leadership. After “preparing for military struggle” (which means to beef up war-fighting readiness and further accelerate the pace of military force building) became a standard line from Xi, the P.L.A.’s propaganda apparatus quickly followed up by launching a large-scale campaign to emphasize the need for military units to be better prepared to go to war. This official fanning of a more strident and gung-ho attitude among the country’s soldiers will contribute to a growing sense among China’s neighbors and major Asia-Pacific powers that a more aggressive China is on the move. It will also likely add to the potential for military conflict, especially inadvertent clashes sparked by miscommunications and accidents as regional militaries and their proxies such as the coastguards come into increasingly close contact with each other. Interestingly, this notion of “core” has deep resonance in modern Chinese history, evoking the seminal late Qing Dynasty argument by the Confucian reformist hawk Zhang Zhidong, who argued that China should maintain its “core” (ti) values, but be willing to “learn from the West” when it came to everything that was not “core.” Today, the “core” is about interests, not values, which is in itself notable. But the basic mode of thinking—of dividing things into immutable core versus changeable externalities—has deep roots in Chinese thought (indeed, going even well beyond Zhang, but that is for a blog on Chinese philosophy, rather than foreign policy). As to the latest twist in the evolution of what is “core,” again from the vantage point of history, as others have suggested, the assertion of core territorial interests vis-a-vis Japan is both more dangerous and more logical. No foreign power did greater damage to China’s “core”—both territory, and very sense of herself, than imperial Japan. Xi Jinping doesn’t have to do much to stoke patriotic opinion within China to enjoy support for pursuing a hardline on the Diaoyu/Senkaku dispute. Nor should we overlook the ways in which Japan’s actions—first nationalizing the islands last year, and now continuing to assert sovereignty in the context of Prime Minister Abe’s revisionist, nationalist moves, are pushing both the Chinese leadership and the Chinese people into inflexible, assertive postures of their own. Susan Shirk’s notion of a negotiated mutual withdrawal is the wise and prudent course. But would Abe agree to such a thing? Most Chinese probably think not. So why should Beijing show flexibility and openness to compromise first? The classic dilemma.